Land speed isn't typically a turtle's strength, but underwater diving is. Even a turtle who fits in the palm of your hand is capable of staying fully submerged for longer than a human can -- several months longer, in fact. While not all turtles have the same adaptations for safely remaining below the surface, they can typically stay submerged significantly longer than people. A turtle is uniquely equipped for holding his breath underwater, as his lungs run the entire length of his shell. The space between the top and bottom of his shell is able to expand and contract. 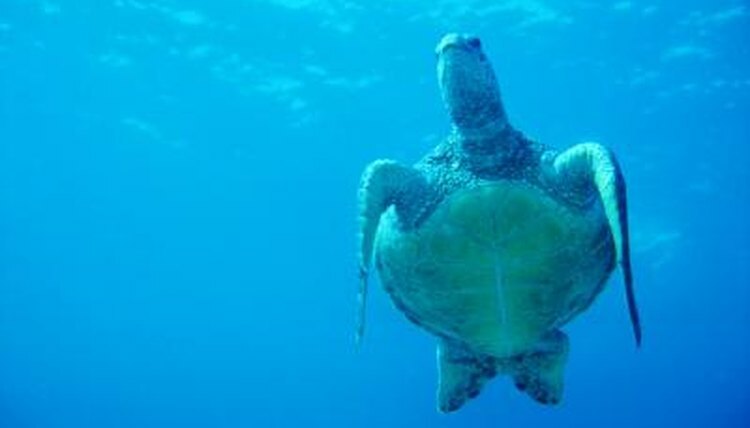 Turtles who crawl on their bellies, like sea turtles, consequently struggle to breath on land, because they cannot expand the way they do in the sea. In addition to his lung capacity, a turtle can store more carbon dioxide in his blood than oxygen-breathing creatures like humans, so he does not have to go through as much oxygen. The length of time that a turtle can remain submerged depends on his activity beneath the water's surface. For example, a sleeping sea turtle can hold his breath for as long as seven hours before he has to return to the surface. If he's diving and searching for food, though, he may need to resurface as often as every 30 minutes to get more air. A turtle who becomes trapped underwater may drown during the struggle to free himself. While a turtle can sleep or rest underwater for hours at a time, he may be capable of remaining submerged for significantly longer. A turtle living in a region with cold winters may bury himself in the mud beneath the water's surface, where he hibernates. Insulated by the mud, he can remain submerged in his state of hibernation for months at a time, not awakening and resurfacing until temperatures rise again. Not all turtles have to breath surface air to survive; these can stay underwater for long periods of time even during seasons they're active. For example, the small red-eared slider -- the most popular pet turtle in the United States -- is able to absorb oxygen in the water through his cloaca. Similar to wild turtles like the Fitzroy River turtle, by absorbing oxygen with this small opening near his tail, he can stay submerged for days at a time. Other turtles can perform similar functions by inhaling water through their nostrils and filtering out the oxygen.